Simple, rustic and pretty describes this wonderful rustic vine wall heart. 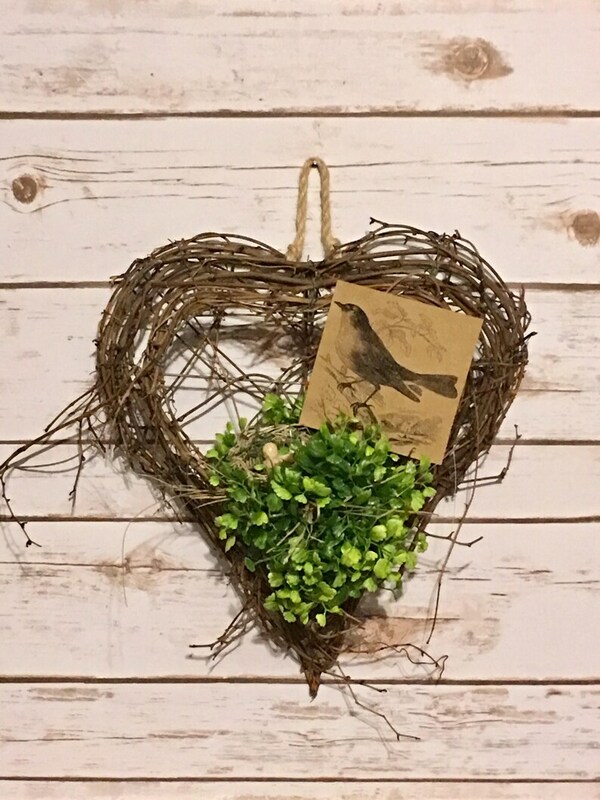 Made from woven grapevine, adorned with a pretty green maiden hair fern, a little bird nest with eggs and a print of a bird that is made from heavy card stock. The wall heart is ready to hang with attached rope hanger. The heart measures approx. 131/2" H x 12" W.
I have 2 wall hearts made and ready to ship. Please allow 3 days for shipping. Thank you Mitzi for the beautiful wreath. I've been shopping with Mitzi for years and she is the real deal. She makes beautiful things and you can tell by the love and detail she puts into making her things. This wreath is so darn cute. Received very fast and I put mine in the middle of a old window pane. Love it! !